During a bowhunt, have you ever just paused and remembered those veterans who gave all? The sun was slowly coming up; the prelude to another glorious September day in the greatest nation the world has ever known. I had been here for a little over an hour after climbing in the dark, and for an aggressive bowhunter like myself, the chances were good that, before too long, a successful maneuver could be made to intercept the bugling bulls and their herd as they climbed to their bedding area. Today, though, I was having a “moment.” Have you ever had one? I’m older now, I guess, and so I find myself slipping back in time and thinking about unpleasant things that have been tucked safely away in the recesses of my mind. Through the decades, they’ve stayed there, mostly, occasionally popping up unexpectedly and causing me to stop whatever it was I had been doing for a brief moment before soldiering on. With the wind right, multiple bulls bugling, and me controlling the high ground, this was not the best time to find myself frozen. What was it, you ask? It wasn’t losing a state high school basketball championship my senior year we should have easily won. It wasn’t missing, in my late 20s, a slam dunk shot at the biggest mule deer buck I’ve ever seen — and my biggest buck to date gross-scores 247 Boone & Crockett points. It wasn’t even the passing of my mother, who was my biggest fan and best friend, when the cancer became too much for her. Today, it was what could have been. Not for me, but for so many of our brave men and women who gave all in defense of America. Recently “The Wall That Heals,” the traveling half-scale 375-foot long, 7.5-foot-high replica (right) of the Vietnam Veterans Memorial in Washington, D.C., made a stop near my southern Arizona home. For many of my generation, a visit to the real wall in D.C. or to this traveling exhibit is an extremely difficult thing to do. 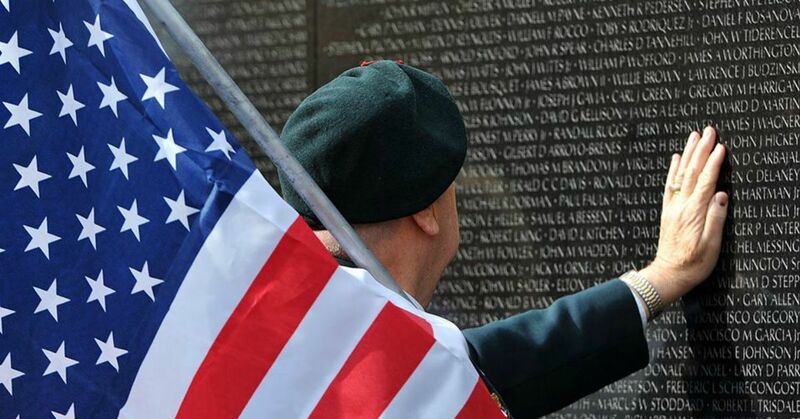 My friend and colleague Steve Comus, who found himself immersed in the horrors of jungle warfare in the late 1960s, said it best “When I see the names of men I served with on the Wall, I lose it, even after all these years. How can a name carved in a piece of rock be so powerful?” Partially because, by luck, their tomorrow ended one day when, in the blink of an eye, all they had and all they ever would have had was gone. And you are still here. So on this morning, my thoughts turned to two of my best buddies, Jim Boyce and Jimmy Velasquez. Jim Boyce. Navy SEAL, did two Vietnam combat tours in the late 1960s. Somehow he survived that hell (today he’s a 100 percent disabled veteran), came back home to the Seattle area, married Sue, moved to Alaska, became an Alaska Master Guide — Sue’s a nurse for the Veterans Administration — and together they raised two wonderful daughters. I guided for Jim after hunting and fishing with him several times. Together we had adventures in the Alaska wilderness that if I told you the truth about some of them you’d think I was making it up. They were glorious days, some of the best of my life. Jimmy Velasquez: California native, two Vietnam combat tours in the late 1960s as an aerial gunner, one of them for the infamous and secretive Air America, the CIA’s private little airline that went places it shouldn’t have. Seriously wounded, Jimmy’s OK today physically. His first marriage, like many of those of his time and experience, didn’t work out, but it did produce wonderful children, all of whom I call friends today. At one time Jim owned Sagittarius Quivers, then his own San Diego area archery pro shop, where today he still works part time. I met Jimmy in the early 1980s when he worked for the old Browning Archery and I was on their pro staff, and we’ve been blood brothers ever since. I mention Jim and Jimmy because, for me, these men epitomize the very best America ever produced. They came home from an unpopular war and did their best, though in private both will admit that they, too, have “moments,” and these have produced challenges that altered the trajectory of their lives in ways only God knows. You’ll never meet men with bigger hearts, that support our veterans more, or who love America more than they do. And so on this morning I wept a little, thinking not so much of bugling bulls, but of Jim and Jimmy and Steve Comus, and the tens of thousands of Americans who, just in my lifetime, had not just served but who gave all so that you and I could sit on a rock and watch the sun rise. Have you ever had such a moment? Drop me a note at editor@grandviewoutdoors.com, I’d love to hear about it.